on the 2006 National Tall Fescue Trial. Hope your winter is going well. We recently published on the web a fact sheet update on Tall Fescue Varieties for New Jersey Sports Fields. This fact sheet discusses the characteristics of traffic tolerance, turfgrass quality, and susceptibility to brown patch disease (caused by Rhizoctonia solani). Traffic tolerant varieties are more persistent under the combined stresses of wear and compaction, which are very common on sports turfs. The variety recommendations in this fact sheet are based on research conducted at Rutgers University on the 2006 National Turfgrass Evaluation Program (NTEP) Tall Fescue Test. Data from other locations was also used for these recommendations. Looking forward, we received partial funding from NTEP to study traffic effects in the 2012 National Tall Fescue Traffic Trial. The objective of this trial is to evaluate the persistence of tall fescue varieties and experimental selections to traffic caused by the Rutgers Wear Simulator (RWS) and Cady Traffic Simulator (CTS). One-hundred-sixteen (116) entries of the 2012 Tall Fescue Trial along with 4 other entries were established at Hort. Farm No. 2 in North Brunswick, NJ. Once these plots are grow-in (September 2013), application of traffic will be initiated. One or two passes per week of the RWS and CTS will be operated as strip-plots across a 4-ft portion of each plot for an 8-week period (16 Sep. and 15 Nov. 2013). A 4-ft section of each plot will not receive wear or traffic. 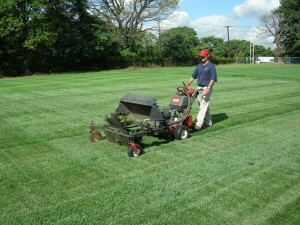 Plots will be rated monthly for turf quality, fullness of turf cover, and other parameters as needed. You can look forward to future updates on tall fescue variety recommendations.